The Lambda HPX-L5 was created as a liquid light guide coupled version of the HPX, our newest high power LED light source. The liquid light guide allows for LED cooling via an internal heatsink with a whisper fan. This requires less maintenance that the liquidcooled direct mount version. Designed around a single 90W 3mm LED die, the Lambda HPX-L5 provides light output comparable to a 150W xenon arc lamp when using the same light guide. 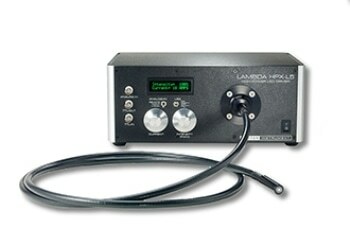 The Lambda HPX-L5 is optimized for coupling to an optional 5mm liquid light guide, and off-the-shelf microscope adapter. The HPX is expected to retain 95% of its original output at 5000 hours, and 80% after 10,000 hours. Because LEDs exhibit color shift with current change, the Lambda HPX was designed to dim the LED using either PWM or current control. PWM will be preferable for most applications, and allows the LED to run cooler. PWM switching is at 28KHz, high enough for use with most high speed cameras. For those with applications intolerant of any pulsed output, dimming via current control is also available. PWM and Current information are conveniently displayed on the front panel display, and are manually selectable via control knobs. Integral shuttering time is 10 microseconds to turn on and off. TTL input and output allows for triggering from either software or directly from another device such as a camera or digital IO board. PWM can also be controlled externally via analog input. Active temperature monitoring insures that the LED life will be maximized. Light output is in the visible spectrum from 430nm-700nm. Special order units are available with 630nm, 530nm, 460nm, and 405nm wavelength specific LEDs. The Lambda HPX-L5 can also be combined with our TLED to create a two-channel system with any combination of wavelengths.